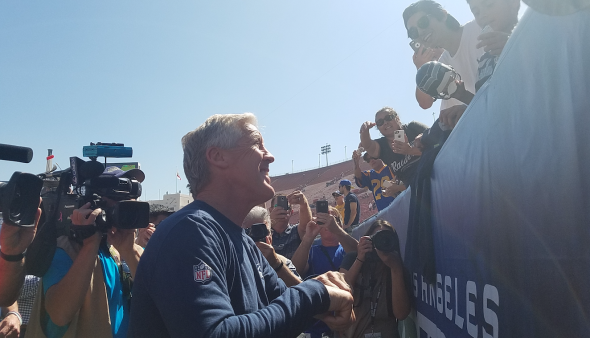 It’s been 22 years since the NFL played a game in Los Angeles, thrilling a California kid who grew up with the Rams as part of the sporting furniture — Seahawks coach Pete Carroll. LOS ANGELES — At about noon Sunday, the public address announcer at the Los Angeles Coliseum said it had been 13,427 days since the the yellow and blue had trod upon the sacred sod: “Are yooooou readyyyyy?! ?” he bellowed. The early arrivers mustered a hearty shrug. Many were not born the last time the Rams played here. The Rams played in the Coliseum from their arrival in Cleveland in 1946 to 1979, then moved to Anaheim and Angels Stadium from 1980 to 1994. Then they were the St. Louis Rams for 21 years, somehow stationed in the NFC West when the Seahawks arrived in the division in 2002 from the AFC West. The Central Time Zone location was always a major inconvenience for the Seahawks, considering how much travel they were booked for anyway. And the relocation means players who grew up here or played college ball in Southern California get to see family and friends. “It’s just fun,” Carroll said. “It’s a great place to play whenever you get to play there. Whether it’s the Olympics, football, baseball, or whatever. It’s a great place and it always has been. It’s just fun to go there. They should. The Rams have won three of the past four against Seattle, which leads the all-time series 21-14 but is 0-2 vs. the Rams in LA. This is the first game against the Rams in LA since 1988, although they last played the Raiders here in 1994. If Seattle, a 5½-point favorite, wins Sunday, it will be a franchise-record sixth consecutive road victory. Carroll arrived in LA in December 2000 for the USC coaching job and was immediately immersed in the perpetual talk of the NFL’s return. “I was really aware of it because the conversation was on way back when,” he said. “There was a time when (Commissioner Paul) Tagliabue came through and Roger Goodell was his underling, and they were kind of fishing for what the climate was in California, Southern California in particular. Rookie RB C.J. Prosise was one of the seven Seahawks on the inactive list released before the game. He had been practicing with a cast on his hand to protect a cracked bone. But for a third-down back expected to catch passes, it was impractical. That meant rookie RB Alex Collins will see his first NFL regular-season action, after being inactive last week. Also inactive were WR Tanner McEvoy, CB DeAndre Elliott, LB Dewey McDonald, RG Germain Ifedi, TE Nick Vannett and DT Garrison Smith. The Seahawks also activated OG Rees Odhiambo, the who would play right guard in case starting RG J’Marcus Webb falters against Rams’ DL terror Aaron Donald. Growing up in Seattle the Rams were my favorite NFL team until the Seahawks came along. Strangely enough I happened to be living in LA at the time when the Rams moved to St. Louis. Good to see them back in LA. It was nice for a change to watch a game in bright sun played on natural green grass, rather than in a cave dungeon. Seeing the old-style numerals chalked on to the field, and flame lit.